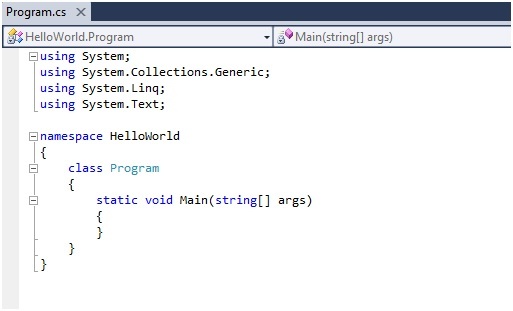 C#.Net: First program in C#, how to write our first program in C#.net under Visual Studio IDE, and this program will print the "Hello world" on the console output screen. Now let’s start C#.Net programming with first C# program that is "print Hello world" which is the first program of all programming languages. 1) First click on FILE menu. 2) Select new project option. 3) Then following window will appear on your screen. 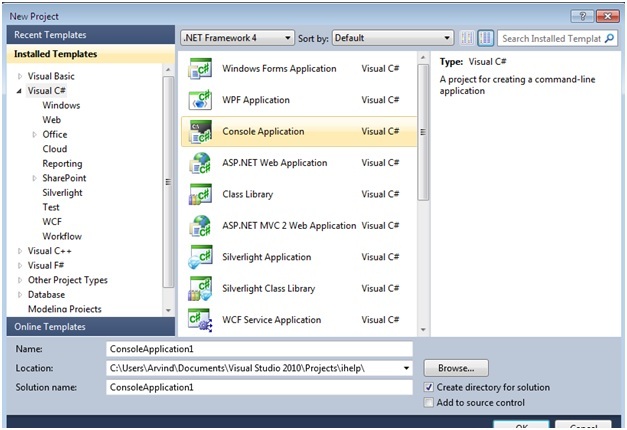 4) From above screen select language (Visual C#) and then choose Console Application and name the application and choose path to save application. After that Visual studio generates sample code. 5) In above program visual studio automatically add some namespaces. But for "Hello World" application only System namespace is required. Here, in this program HelloWorld is the namespace that we created, Namespace may contain many classes but in this program it contains only one class named program and main() is the method of class which is an entry point of the program.